Tired of hassling around with iTunes when you want to quickly find and play a song? CoverSutra is a Mac App now available in the new Mac App Store for $4.99 that lets you search your iTunes music library quickly from the menu bar with a very nice and simple display that presents your songs as a compact disc jewel box or vinyl record while you listen. The app runs smoothly and uses only about 25MB of real memory when running in the background on your Mac. From the search menu, you can find any artist, song, record, and playlist by name. Type in a few words and CoverSutra pulls in all the tracks and albums that match your keywords. This is prefect for digging through your large music collection instantly, and perhaps even finding songs you had forgotten about. From the search results window, right click on an album or song to either play it right away or schedule it to play next via the CoverSutra player. When songs change a growl like notification pops up from the menu bar for a few seconds that shows the next song info and cover art. The CoverSutra app has 2 other windows. First is the Jewel Box Album Cover window that is a super sleek realistic looking cd box that displays your album cover art with style on your Mac desktop. Below it CoverSutra shows text labels for the Album and Song. The other window is the Player Controls floating box. This translucent box also displays the cd cover art, along with player controls, star rating info, iTunes controls and more. You can hide/show either or both of the 2 windows from the CoverSutra preferences. If you don’t have album art for some of your songs, CoverSutra creates a generic album art with the name and artist info using felt market fonts. In the CoverSutra preferences you have a ton of things you can change about its general layout, plus you can manage the keyboard shortcuts for the app. Pick CoverSutra to launch automatically either when you login to your Mac or when iTunes launches. The Menu bar icon and Dock icons can be toggled on/off and notifications for now playing songs can be customized to show when the song and or album changes, or if you prefer you can turn those off. As for the beautiful cover art boxes, you have 3 choices for that window: the classic cd jewel case with the black trim, a fully clear cd jewel case, and a retro vinyl layout. If you choose to go with the dock icon route for your setup, what’s cool is the icon used for CoverSutra on the dock changes with the cover art. If you a keyboard shortcut geek, CoverSutra has you covered. Look in the app’s prefs to find a powerful menu for setting up keyboard shortcuts to do just about anything you want in your iTunes collection. Keyboard combinations for everything from music search, player controls, star ratings and more can be custom tailored to your liking. Take some time to set this up and you’ll be pulling up songs and rating them like a pro. If you use Last.fm you can login and CoverSutra will find new music and concerts you like. For 5 bucks, CoverSutra is a must have app if you have a large iTunes music collection. Fans of You Control Tunes will love CoverSutra. Its powerful searching feature built right into the menu bar makes your music library come to life and even spices things up with some fancy jewel box action. The one feature missing for me is that the search feature doesn’t currently find your podcasts or radio stations, although it does find audio books. While you might be able to do most of the searching using Spotlight hackery, the CoverSutra app adds a lot of value to your music playing experience that makes it advantageous. This Mac App is available in the Mac App Store. Browse the full list of all Mac apps filed under the Mac Apps category. 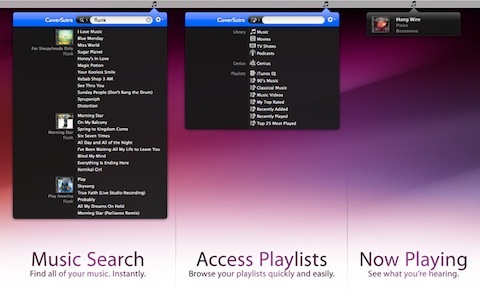 AppSafari review of CoverSutra was written by Joe Seifi on January 8th, 2011 and categorized under Featured, Mac Apps, Music, Utilities. Page viewed 3563 times, 1 so far today. Need help on using these apps? Please read the Help Page.